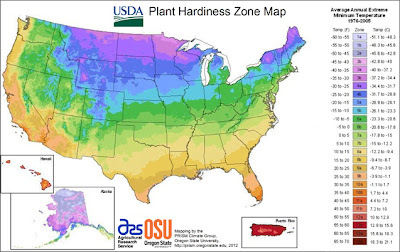 The USDA just updated it's Plant Hardiness Zone Map. Click here to go to the map. It is more sophisticated and accurate than any other previously developed. Several areas underwent a zone change, including my little corner of the Pocono Mountains, PA. We went from 5b to 6a. The new map has links to view states divided into counties, and even a handy zipcode search box. This took a long time to be ready, but the interactive component by zip code was worth waiting for. 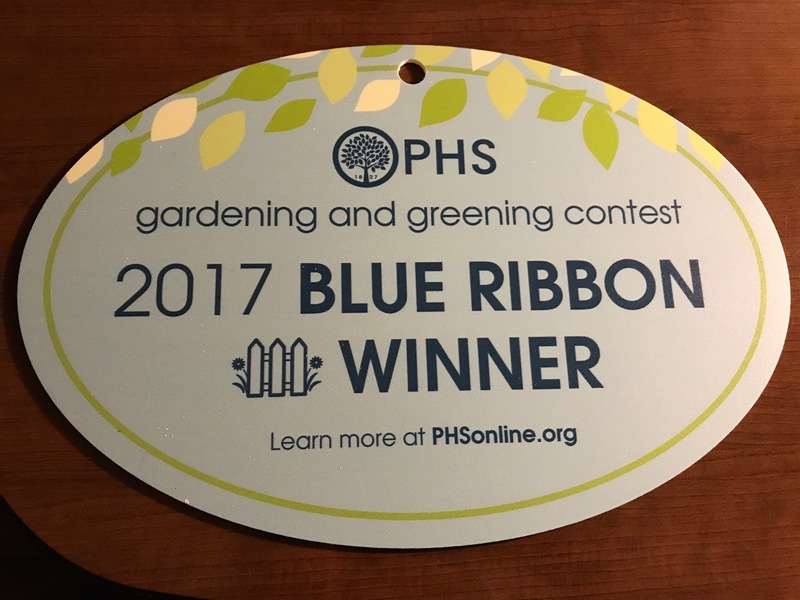 The USDA describes the 2012 USDA Plant Hardiness Zone Map as the standard by which gardeners and growers can determine which plants are most likely to thrive at a location. The map is based on the average annual minimum winter temperature, divided into 10-degree F zones. The Washington Post produced an interactive map with a fancy slider in the middle so you can compare the old map with the new. Click here for the link. 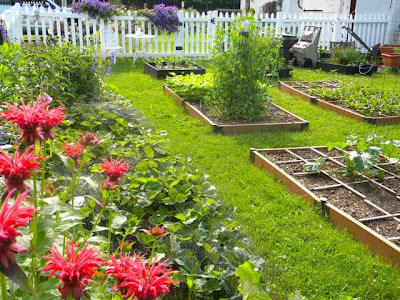 This is really interesting not only for gardeners, but for those collecting examples of the impact of climate change on all of us. In other news the National Wildlife Federation has decided to end its partnership with Scott's. Yoo...hoo! Maybe the scathing letter I wrote them made a difference! I'd like to think so. I wont be taking down my sign after all. 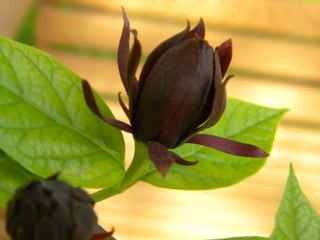 Calycanthus floridus has the common names of Eastern sweetshrub or Carolina allspice. This native plant provides beneficial cover and food for wildlife, it has seasonal interest, and the flowers and fruit are truly unique. 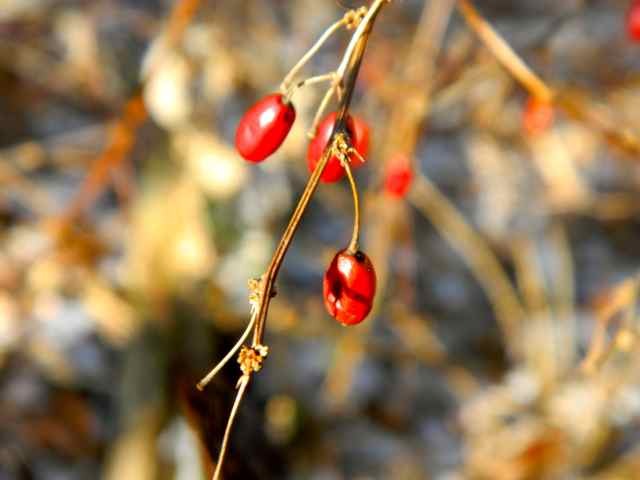 Crush the leaves and twigs to enjoy their delightful fragrance. Hardy in zones 4 - 9, sweetshrub is easily adaptable to a range of light, soil and water conditions! 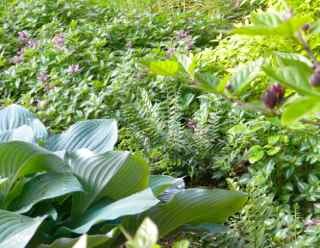 I planted three of these interesting shrubs in my shade garden several years ago. They delight me more each year. Located at the back of the shade garden. Spring 2011 - they filled out nicely. 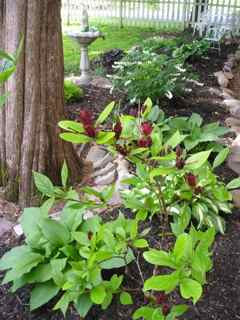 Sweetshrub adds another texture and fragrance to the shade garden. Sweet shrub blooms from April to July. The dark red flowers remind me of lotus blossoms. 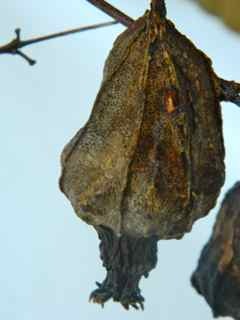 The green, bell-shaped seedpod turns to light brown. 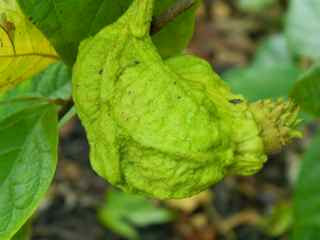 It is somewhat woody at maturity, 1 to 1 1/2 inches long, maturing in late summer/ early fall. The 'capsule' turns brown in the fall. 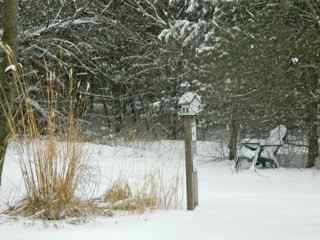 Last weekend we had the first snowstorm of the winter season. (It's amazing that it didn't arrive until near the end of January.) My garden looks so much better covered in snow: The true bones of the garden appear and you can better appreciate those plants with winter interest, like sweetshrub. 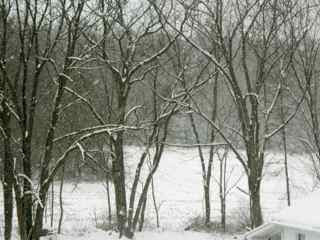 I awoke to snow falling at the weekend. 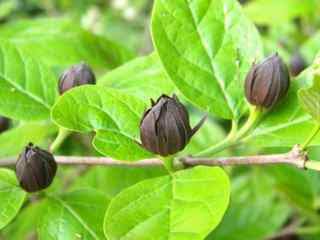 Three calycanthus shrubs next to the garden swing. 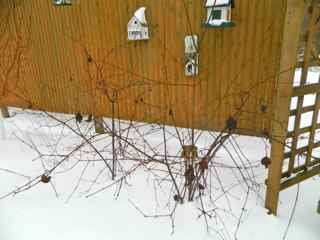 Seed pods remain on the shrubs. Seed pod in the snow. I am so glad I didn't cut down the ornamental grasses. 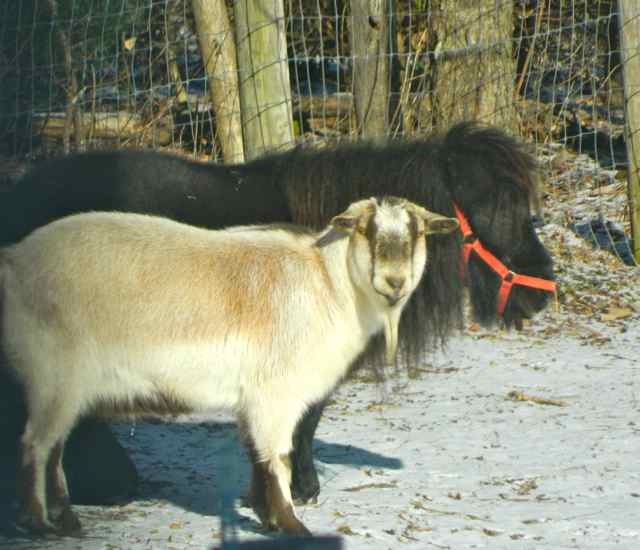 Most of the snow has gone already and my garden is a mess of mud. 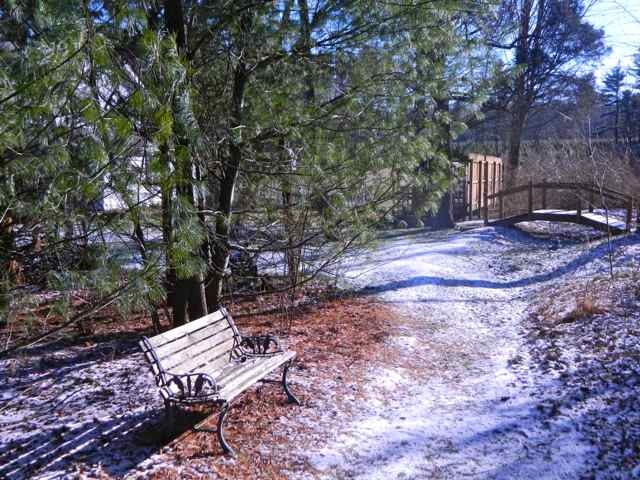 What a weird winter this is. 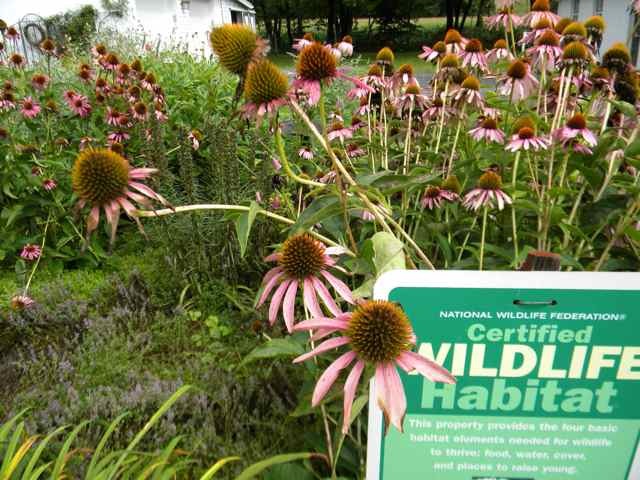 I am celebrating native plants today with Gail at Clay and Limestone. 1. Lady Bird Johnson Wildflower Center, Native Plant Database. 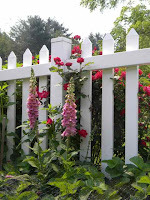 Holley at Roses and Other Garden Joys has started a new meme today: Monthly Garden Book Review. I have a large collection of garden books, so I am happy to join in the fun. My first review for 2012 is of The Potting Shed by Linda Joan Smith. I will illustrate this review with pictures of my own potting shed. 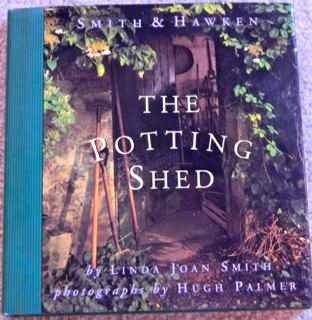 Smith takes a very whimsical look at potting sheds in this little book. 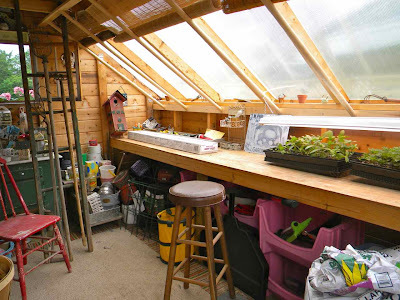 I find her wistful prose quite charming as she portrays the purposes and pleasures of the gardener's workspace (not always a shed, but perhaps a corner of a garage or laundry room). The book is in two parts: The first part called 'Where the Garden Begins' discusses the pleasures, traditions, and tools of the potting shed. The second part takes us through the gardening year, and is entitled 'Seasonal Joys and Timely Labors'. 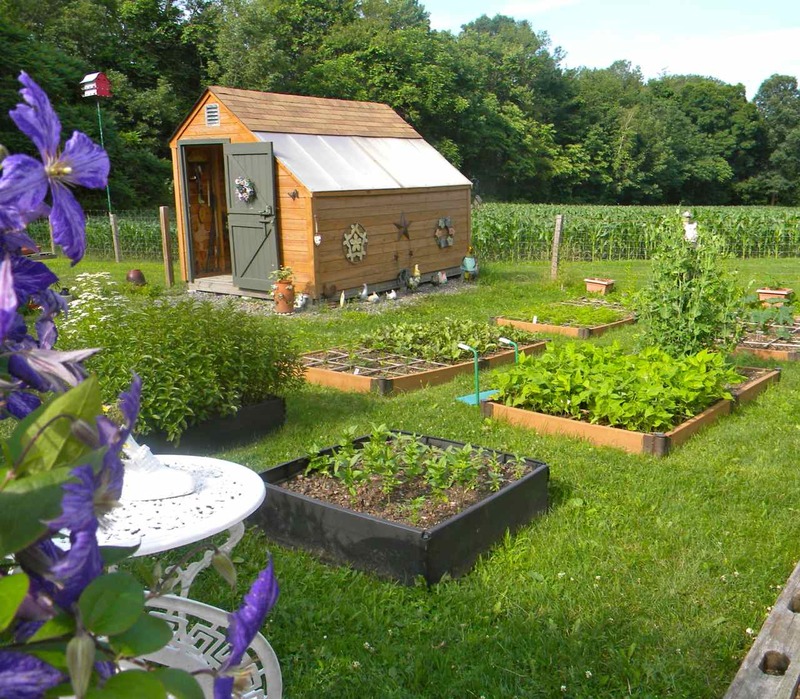 "The shed's hallmark, of course, is a potting bench, a yard deep and as wide as space allows," Smith says. I start seeds in the house, then place them under a light on the potting bench. She describes how to equip the potting shed with hooks and racks, bins and baskets. She devotes a chapter to tools. I found this useful cabinet in the attic. 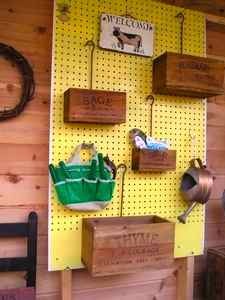 Crates for storage hang from hooks in my shed. She shows the potting shed as a very personal space, a sanctuary of each gardener's own making. ... and with other finds from the attic in our old farmhouse. Throughout Smith's book there are gardening tips in side boxes, from how to make compost tea to making seed starter mixes. There are also boxes containing charming quotations. One of my favorites is by Ralph Waldo Emerson, "My hoe as it bites the ground revenges my wrongs, and I have less lust to bite my enemies. In smoothing the rough hillocks, I sooth my temper." It is obvious to me that Smith really is a gardener! If you want to know how to build a shed, this book is not for you. It is an 'ideas' book rather than a 'how to' manual. You would be better reading Building Great Sheds by Danielle Truscott. 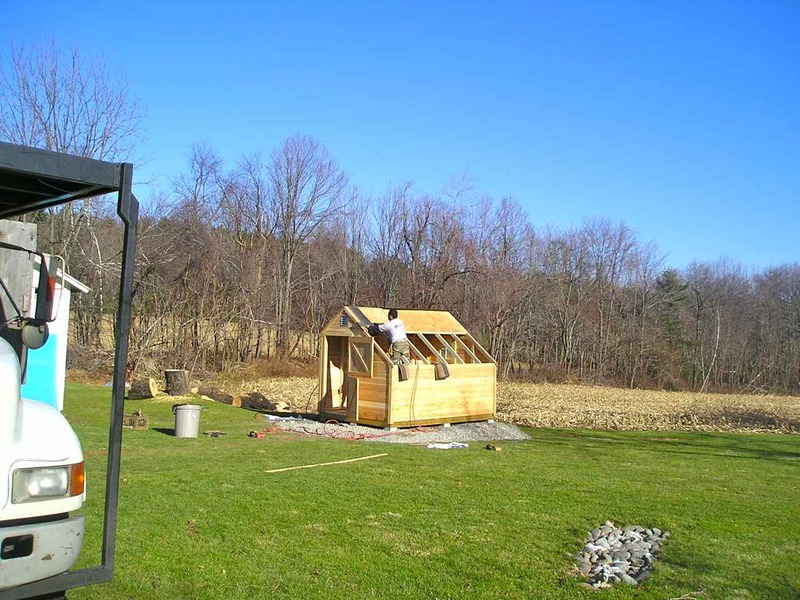 The construction of my shed. 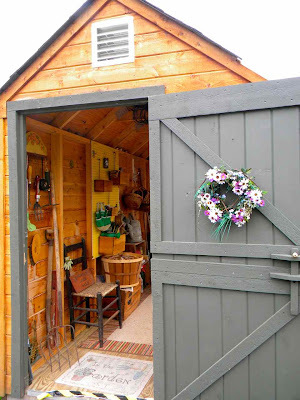 I change the outside decoration of the shed frequently. Chickens this year. I open Smith's little book often, not only for the prose but also for the photographs that bring back memories of my Dad's shed. Hugh Palmer's photographs are of REAL sheds, often quite rustic, showing the true purpose of a potting place. 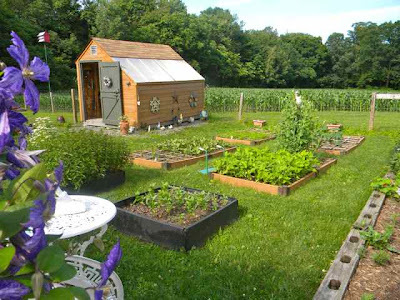 Each shed reflects the personality of its owner. 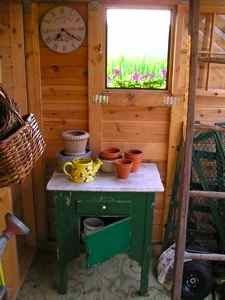 This book is not for every gardener, but you will enjoy it if you are crazy about potting sheds like me. 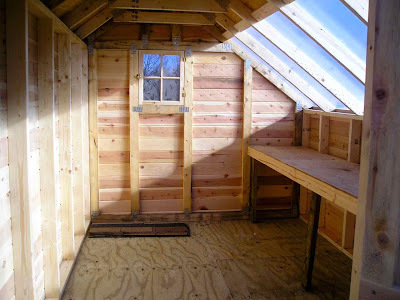 (Some people think that I'm just crazy to feel so passionate about a shed.) 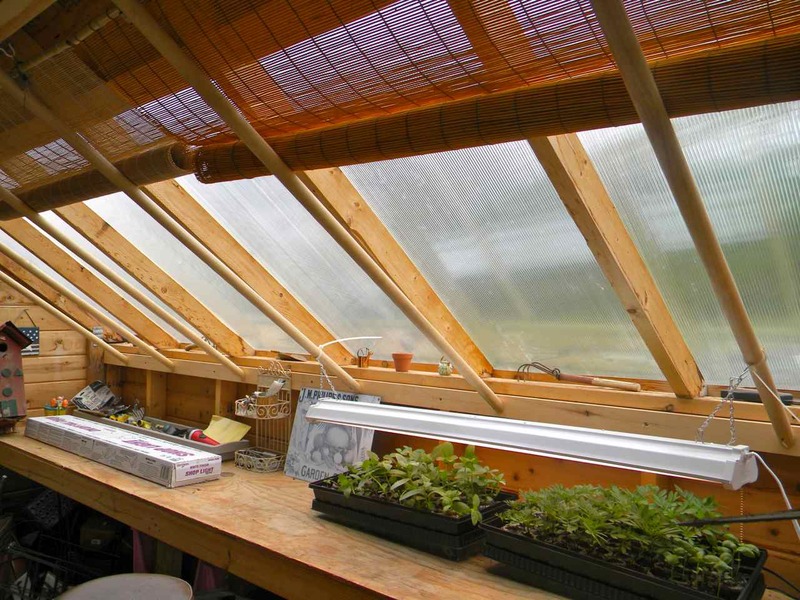 But this book could make you look at potting sheds differently. Thank you Holley for hosting this meme. 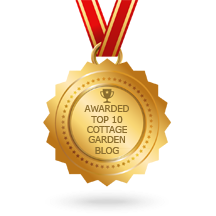 I'm now going over to your blog, Roses and Other Gardening Joys, to read some more book reviews. 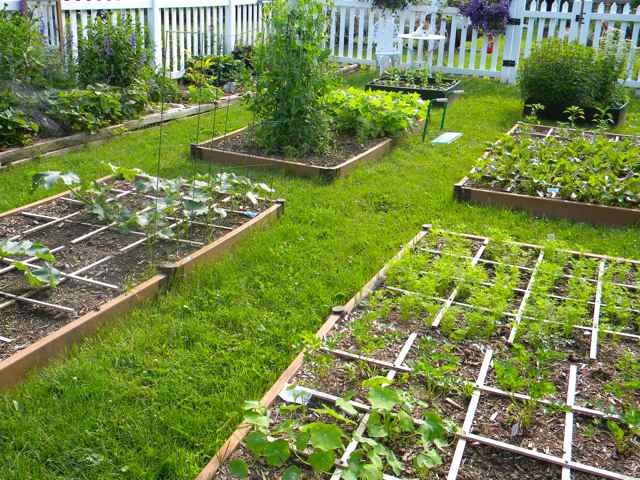 I know I'll want to add some of them to my collection -- there goes the 'spend less on gardening' resolution. We are getting our first plough-able snowfall tonight, so it's perfect weather for reading. 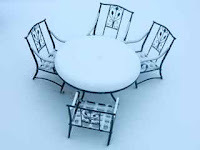 We had a sprinkling of snow last night. It was the first of the season, not counting the freak snowstorm in October while I was in England. The snow shower came with bitter cold temperatures, a high of 23F (- 4C), and a keen wind. I was reluctant to venture outside to take photographs for Garden Bloggers' Bloom Day, so I took most of my pictures through the garden-room windows. 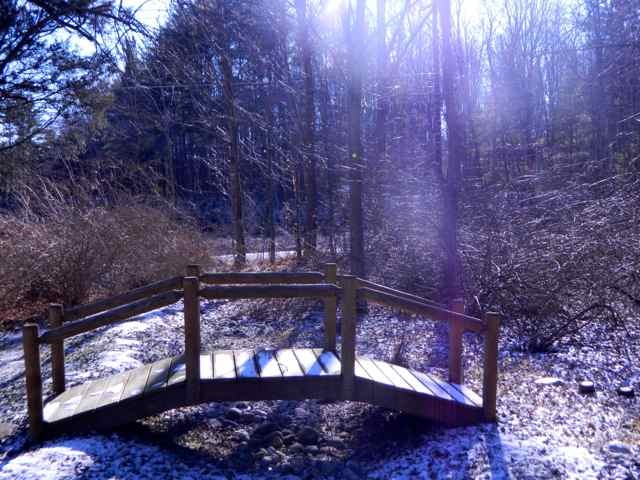 Then I took a very short walk around the garden, snapping pictures as best I could without removing my gloves, before dashing back into the warmth of the house. 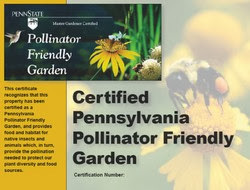 Of course, there are no actual blooms today in the Pocono Mountains, in spite of the recent unusually high temperatures. Berries and birds are my blooms for today. It was bitterly cold in the Woodland Walk in spite of the bright sun. Crabapples looking shriveled, but still plenty on the tree. Backyard birds through my window. 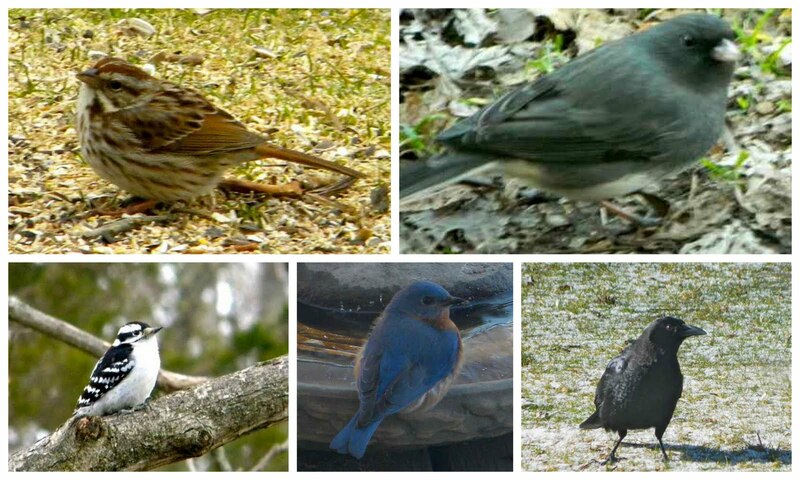 In the collage, clockwise from top left: song sparrow, dark-eyed junco, American crow, bluebird, and downy woodpecker. These birds thrive in a winter environment. 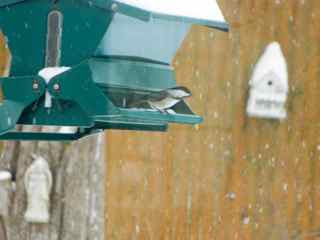 The sparrow and junco are ground-feeding birds that spend much of the winter under my bird feeder picking up fallen seeds. The dark-eyed junco is the most frequent back-yard visitor, foraging on the ground by giving a double shuffle with spread feet and a quick jump backward to throw the snow behind it and uncover the seeds beneath. Crows are noisy creatures. 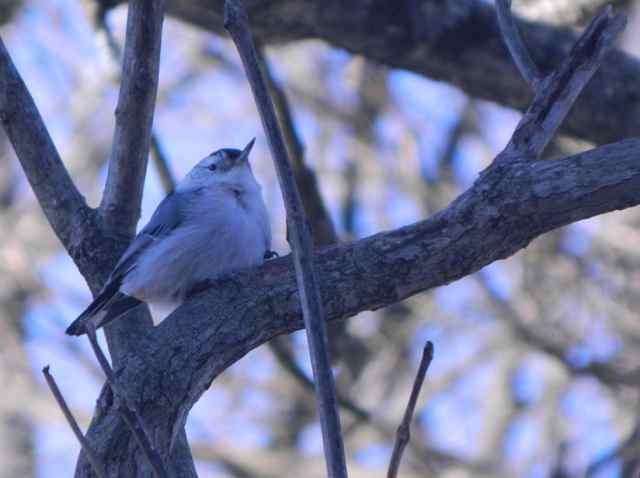 They congregate in the top of our walnut trees and demonstrate an impressive repertoire of vocalizations. Crows eat nearly anything. 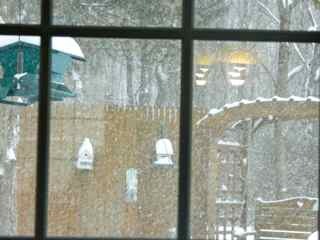 A lone eastern bluebird visited the heated water dish today. Usually there are at least six of them. They keep warm in the winter by snuggling together in one of H.H. 's bluebird boxes. They come to the water dish for the warmth of the heater rather than to drink. The titmouse has supercharge energy levels to keep its body temperature up. 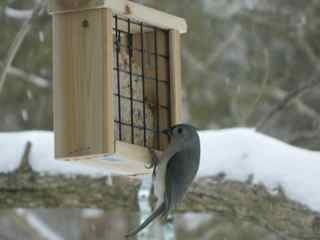 Titmice, like chickadees, eat at least twenty times more food in winter than in summer to avoid freezing to death. 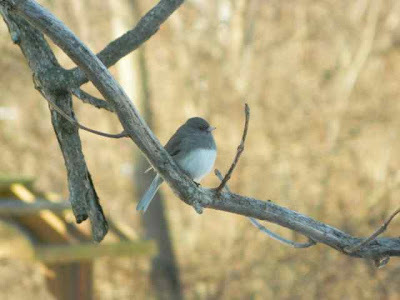 Dark-eyed junco in the catalpa tree outside my window. The nuthatch usually flies to the upper branch of the catalpa tree and then works its way down the tree trunk head first, checking each scale of bark, each twig and branch for insect eggs. The technique of moving upside down from top to bottom is the reverse of other birds' and enables it to detect food that might have been missed by those whose movement is from bottom to top. 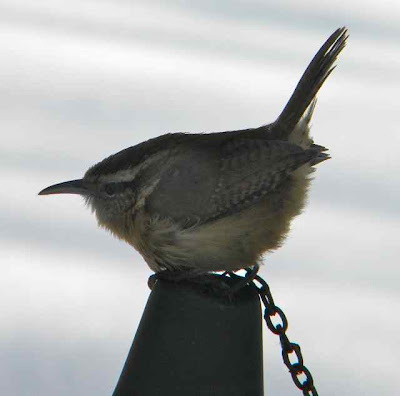 Carolina Wren resting on top of a tiki lamp on the patio. 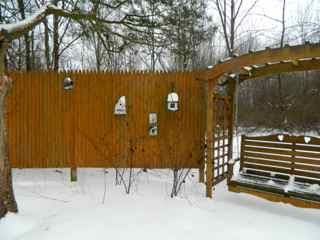 When I hear bird song in the winter I know it is usually the male wren because he sings all year round. A 'winter-looking' entrance to the Woodland Walk. I found flower buds on hellebores in the Woodland Walk. 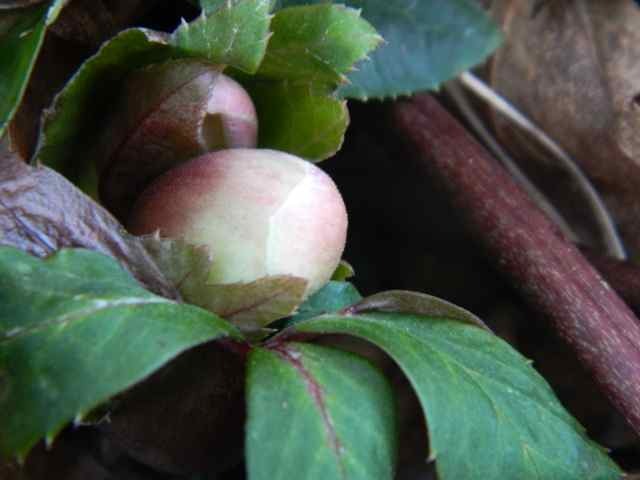 No blooms, but early budding of the hellebore. Last year I didn't record buds this size until a March posting. Billy the Goat stands as close as possible to his buddy, Dude, for warmth. 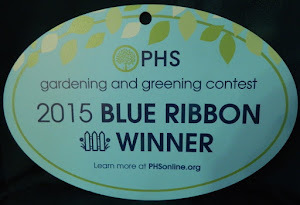 I started the day, as I often do, checking new postings on my favorite garden blogs. I was amazed at the number of beautiful blooms all over the world, displayed for Garden Bloggers' Bloom Day. 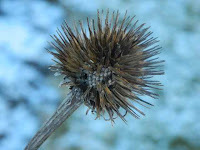 They are listed on Carol's blog, May Dreams' Gardens. Thank you, Carol, for hosting this wonderful meme. I'm sorry I have no flowers to show, but hope you enjoyed my winged 'blooms'. Thank you so much for visiting, dear friends. I appreciate your support! Nasturtium, parsley, and carrots in front right bed. Zuccini and cukes in left hand bed. 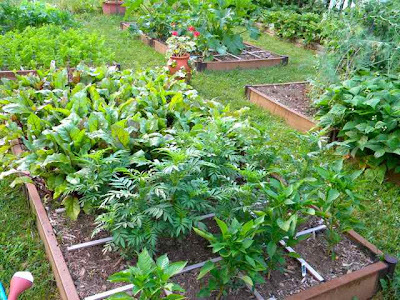 One of my resolutions for 2011 was to try square-foot gardening, having read Mel Bartholomew's book on the subject. I posted about it here. I just spent a happy half-hour reading your comments on that posting (lovely comments from wonderful gardeners), and I feel I need to let you know how the experiment turned out, especially as I blogged very little about my kitchen garden during the year. 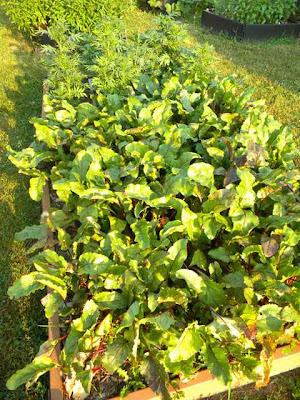 I have four raised beds in my kitchen garden, each measuring 4 feet by 8 feet. 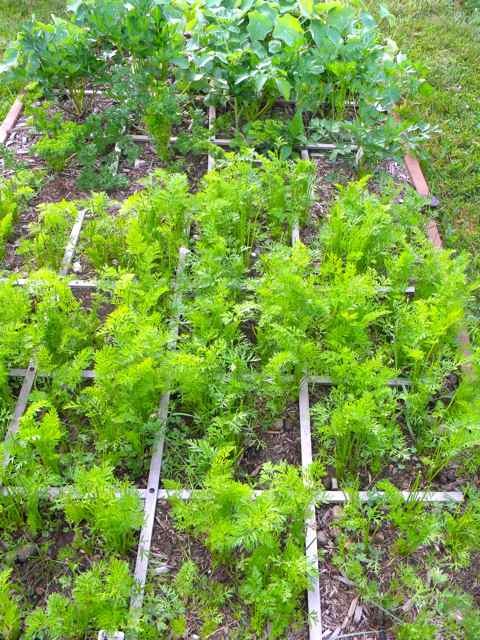 I couldn't grow much in them using the traditional single-row method. There was a lot of wasted space, because each row was spaced as much as three feet apart. 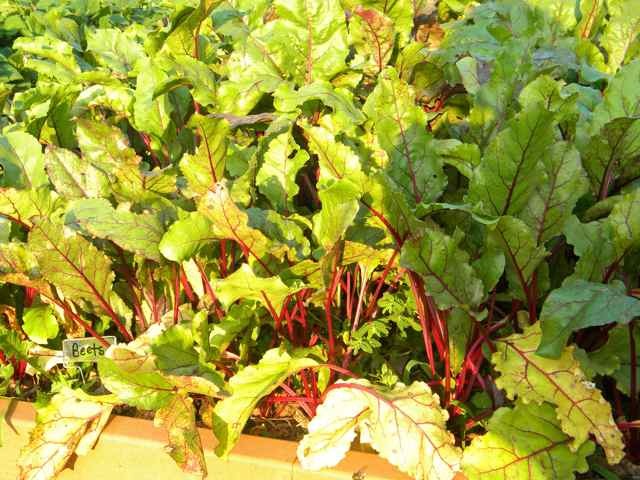 If the plant packet says thin to six inches apart, for example, you can plant four per square foot, according to Bartholomew. This means there are six inches all around each plant, with no need for the three-feet row space. 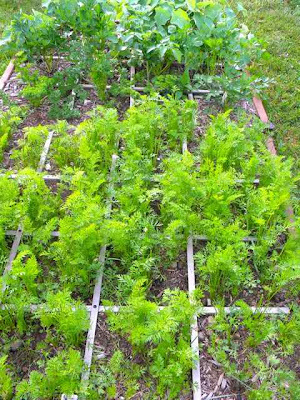 It is not square-foot gardening if you don't have a grid. The grids are easy to make yourself, according to the book, but H.H. and I decided to invest in ready-made ones, as we are not very 'handy' and had limited time -- they were a bit more expensive, but we can use them year-after-year. 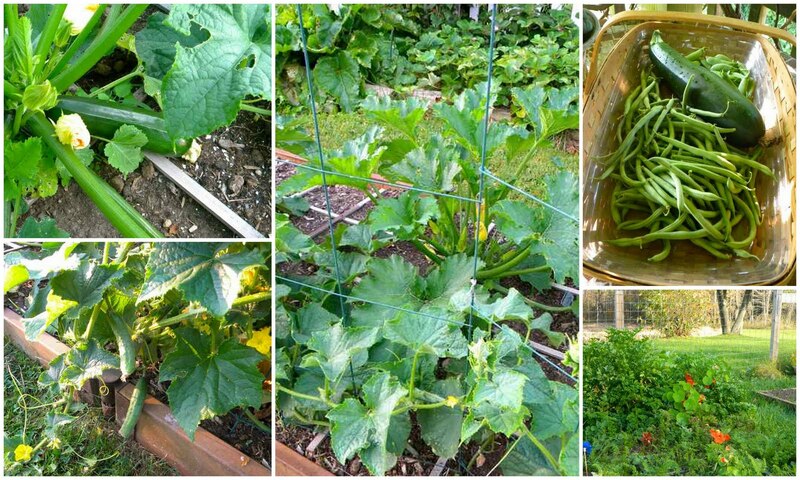 The grids made it easy for me to visualize the harvest. Before laying down the grids, we prepared the soil. 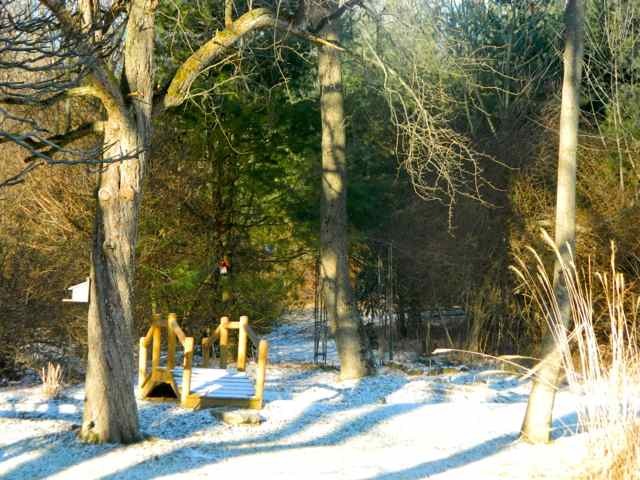 Bartholomew recommends building on top of the ground rather than digging, and this works for me because of the proximity of a walnut tree. 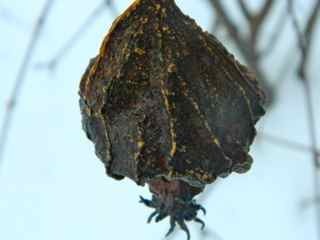 The tree puts poison, juglone, into the soil killing tomatoes and other plants. 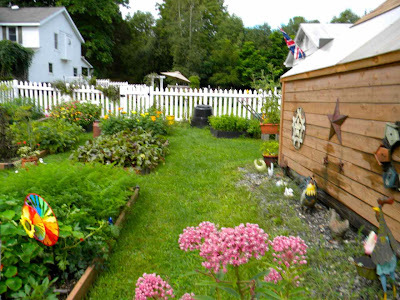 (That is why we built raised beds in the first place.) Bartholomew's growing mix is 1/3 peat moss, 1/3 vermiculite, and 1/3 compost. I decided I couldn't afford to buy vermiculite, so I used two types of compost instead: my home-made compost and mushroom compost that I purchase from the garden center. And of course I added horse manure. 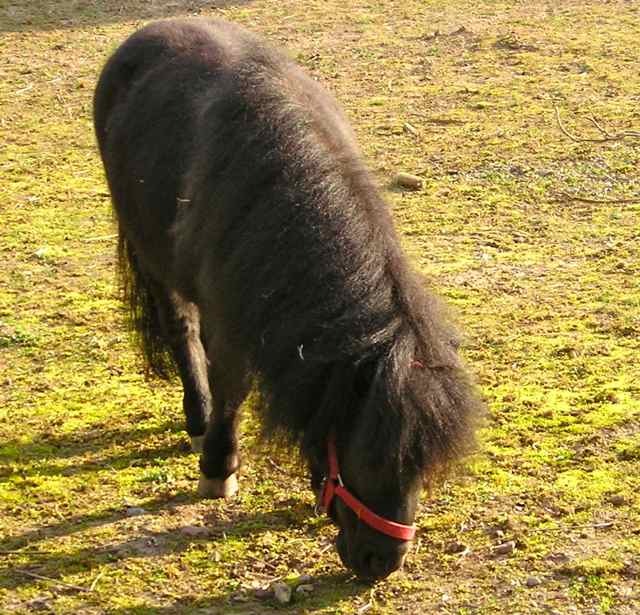 My mini horse, Dude, may be tiny but he produces plenty of 'black gold'. There is no need for fertilizer with this growing mix. 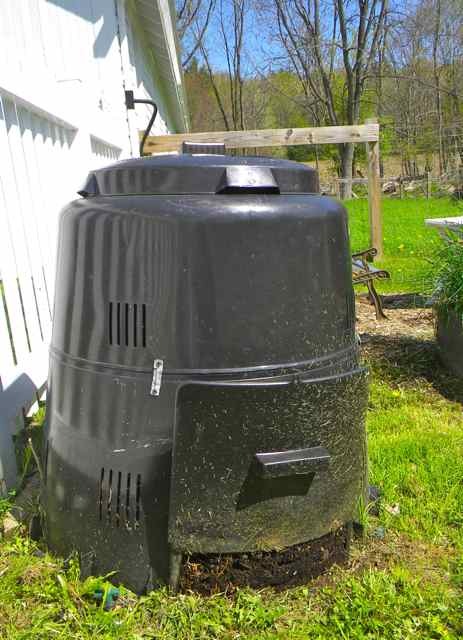 As an organic gardener, this is important to me. Planting the squares couldn't have been easier using the plant-spacing charts provided in Bartholomew's book. I had started some plants indoors from seed, and planted them after the first frost. 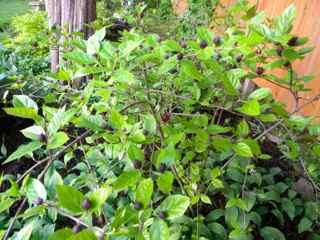 With seeds -- I planted just a pinch right in the ground. 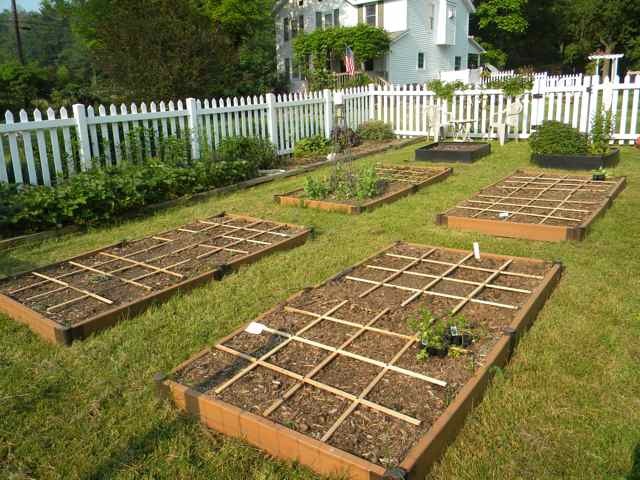 I planted peppers, beets, carrots, zucchini, cucumber, snow peas, bush beans, parsley and annual flowers (zinnias, marigolds, and nasturtiums) in the squares. I grew tomatoes, onions, and herbs in grow boxes. Snow peas are planted vertically (in the bed behind the grow box). Bush beans in front. Thinning the plants was easy. I just snipped off extra plants with scissors, as pulling them out would disturb the roots of the plants that I wanted to grow to maturity. 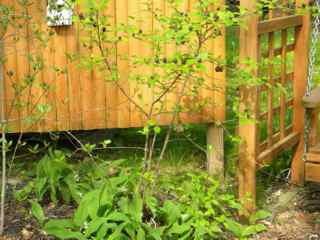 Beebalm, strawberries, and blueberries in the raised bed along the fence. With true square-foot gardening you can grow a different crop in every square, then stagger the harvest. I have such a short growing season, I thought this would be too difficult. 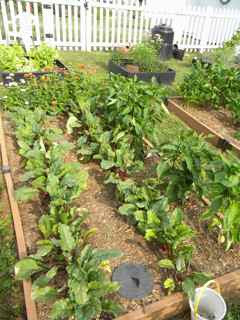 And I couldn't get away from my old method of planting like-veggies in each bed, then rotating the beds each year. I had intended planting lettuce and other salads in the fall, after the beans were harvested, but I was in England then. Beets planted in traditional rows, though with less than 3 feet between. 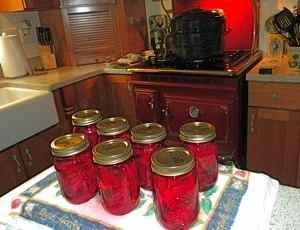 2010's canned beets. I more than tripled the amount in 2011. Overall it was a good harvest. The carrots were a bit small, but that may have been because a pesky rabbit repeatedly munched on the tops. So what will I do next year? 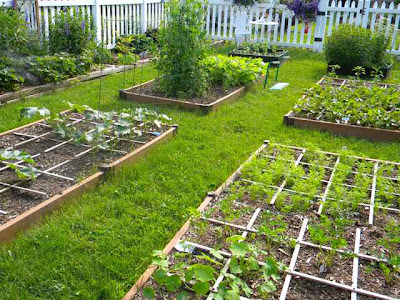 I will definitely try square-foot gardening again. I would like to add vermiculite to my growing mix if I can afford it. 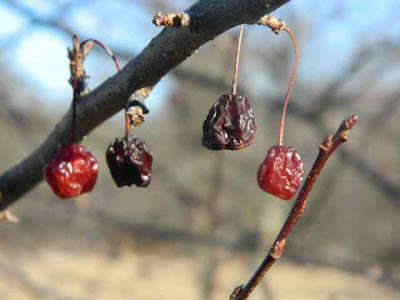 I will plant a bigger variety and try staggering the harvest. It's fun pouring over the seed catalogs and planning!! How was your 2010 vegetable garden?